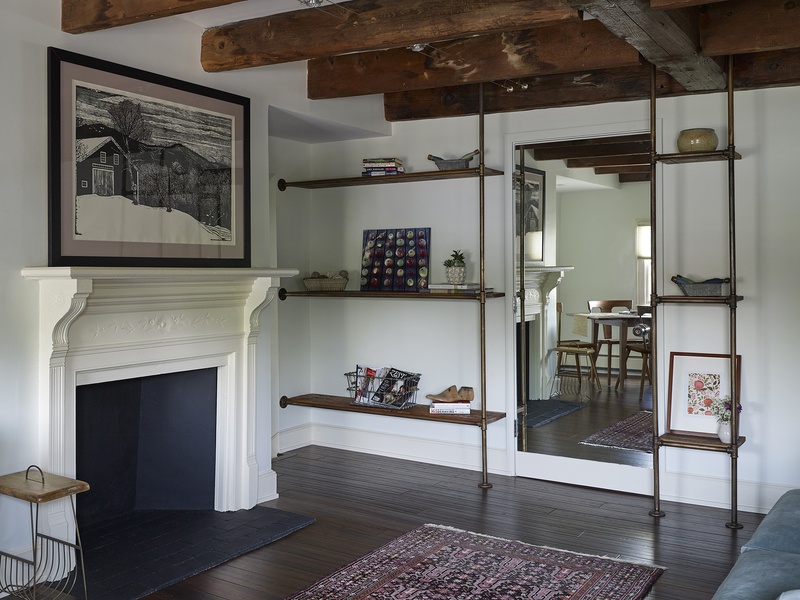 Unit 5 – Tucked away in the heart of Portland’s West End neighborhood, this historic structure was built in 1807 for a prominent Maine lawyer and his family. At the time, it was erected as a large three-floor, six-fireplace, single-family home, with living quarters for the staff on the third floor and a carriage house adjacent. In 2014, the building was converted into a seven-unit condominium space, retaining much of its old world charm and notable character. Elena, one of Knickerbocker Group’s interior designers, was new to the area from the South, and discovered this small city gem. She instantly fell in love with its third floor unit—characterized by quirky low ceilings, exposed beams, and wide-planked pine floors. 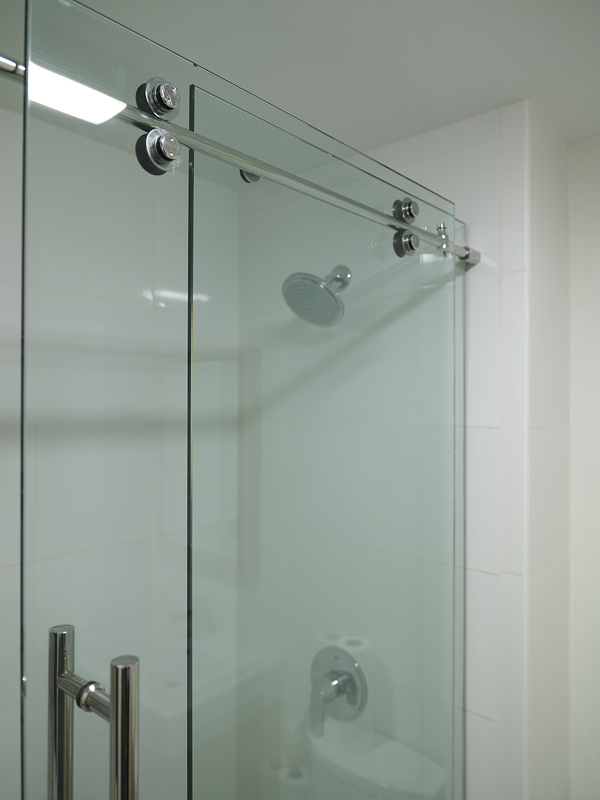 With the beautiful bones already there, she had a keen sense for the changes she wanted to make, and utilized Knickerbocker Group’s construction team to put the finishing touches and updates on her new home. Before making her full time move to Maine, Elena had utilized her Interior Design degree at a high-end antiques store in the Atlanta area. Drawing from her specialized furniture background, her goal was to infuse color and life into the historic building, being careful to choose furniture that was low profile in stature so as to maximize the amount of open visual space across the room. Mid-Century modern pieces, such as the lucite side table and armless velvet chair, are juxtaposed against classic antique items like the brass and steel coffee table. The large painting, by local artist Henry Isaacs, ties together the blues and reds throughout the room and depicts colorful island life on the Maine coast. The master bedroom is located at the opposite end of the unit, flanked by walls of windows with views to the neighborhood streets below. It too shares a fireplace, original to the building, as well as the same 200+ year old wide-plank pine flooring which adorns the whole condo. Along with treasures brought from home, Elena sourced some of her favorite pieces locally: the vibrant chartreuse upholstered chair was spotted at the Portland Flea for All, while the vintage 1970’s glazed lamp and cane side chair were both found at Coco Vivo in Boothbay Harbor. Throughout, this punch of color and playful mixture of furnishings simply accentuate the beauty and history of the building that was present all along. Little did she know that the rejuvenation of this unit would be the catalyst for another out of town buyer to do the same to their newly acquired gem just across the hall! After moving in, Sasha and Jack introduced themselves to Elena across the hall, and in turn, marveled at some of the differences between their two spaces. 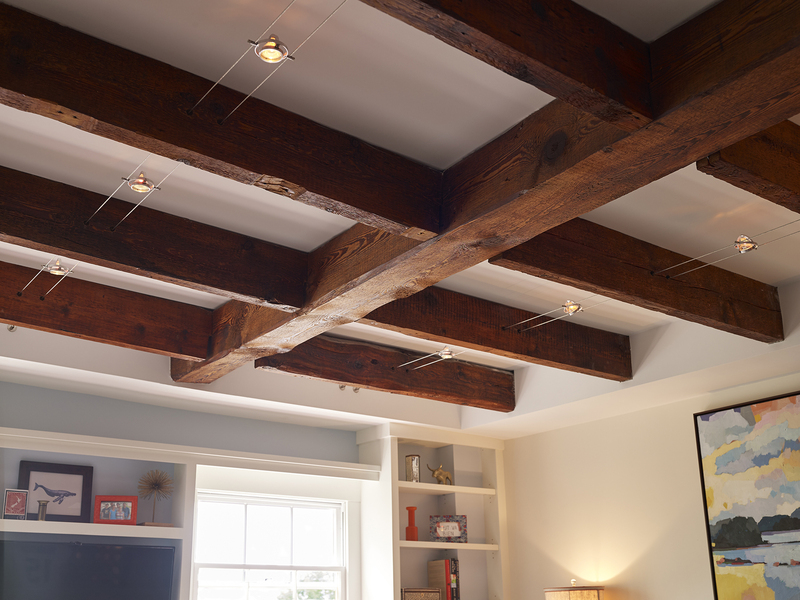 They were immediately drawn to the structural beams on the ceiling of the living room in Unit 5—a visually magnetic feature that was not yet exposed in their space. The new owners were delighted to find out that this beam reveal was a possibility, which then opened the flood gates to more innovative ideas and changes they could make. They explain, “As we sketched and planned for our new place, we focused a lot on preserving and enhancing the historical character of the space. 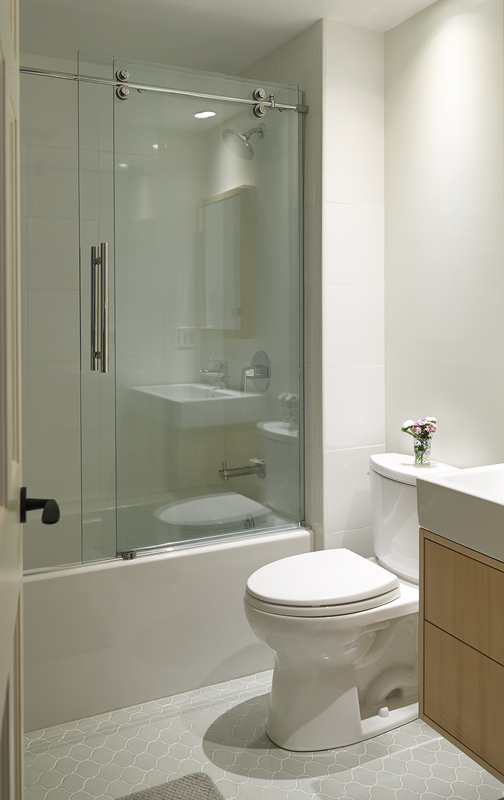 The counter balance to that focus was to make a beautiful living space in less than 1100 square feet.” Their condo suffered many of the same issues as Unit 5, and Knickerbocker Group was able to help tackle them in a similar, yet personal fashion for the new clients. 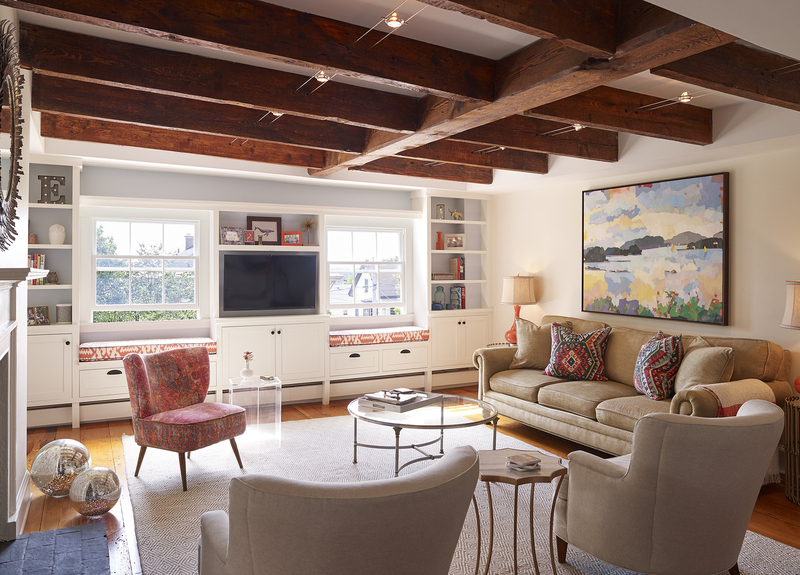 Following the exposure and cleaning of the existing and once hidden beams, Knickerbocker Group suggested the same cable light system used in the adjacent condo to enhance the brightness of the space. 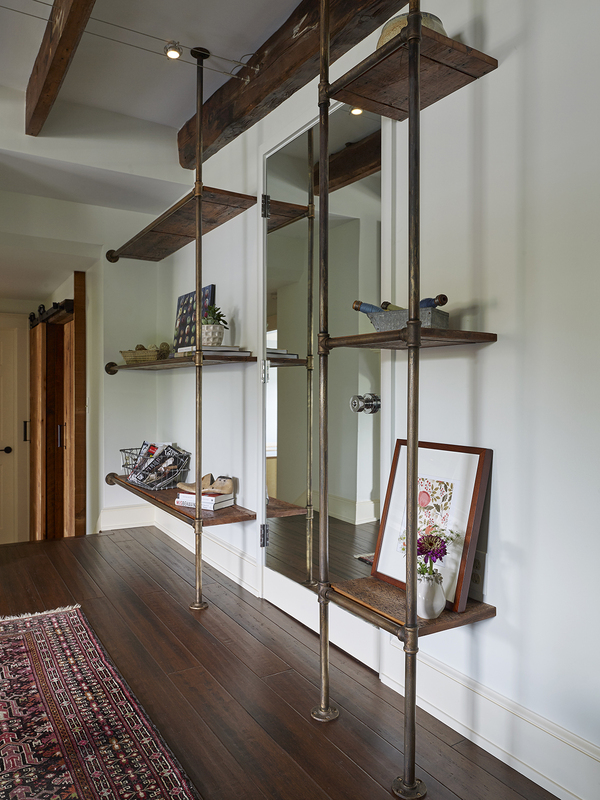 The custom wood and pipe shelving piece on one end of the living room was truly collaborative, with the clients stating, “the Knickerbocker team took all the thoughts, designs, and sketches we had on scraps of paper and in our heads and made them real…they helped us understand what was possible, challenged us, and offered insights into how to bring this vision to life and tie it all together.” Moreover, Sasha and Jack were not fond of the fact that the secondary doorway into their condo opened directly into the living room. Knickerbocker designed a mirror to cover the face of the door, which helped to disguise its function, but also bounced light and views into the space, making it feel larger. The condo had a master bedroom at one end, and a much smaller bonus space at the other that the homeowners wanted to use as both a guest bedroom and an office. 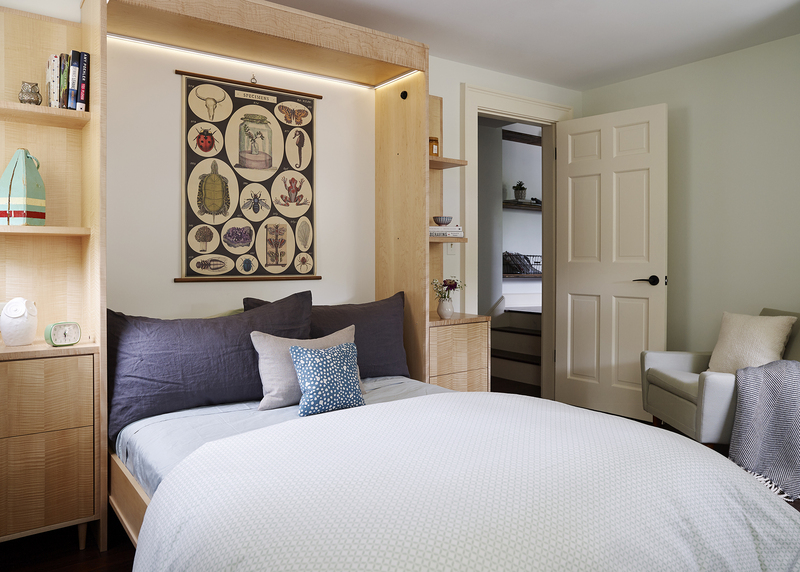 After much searching and brainstorming small space solutions, the answer came in the form of a custom murphy bed. Sasha explains, “It’s a genius invention, and I also love that it raised eyebrows. I think it still has some stigma left over from the 1970s. When we told people about it, they looked at us like we were crazy—until they saw it.” Knickerbocker Group collaborated with a local Maine furniture designer to bring the piece to life. Constructed of maple, it has storage and lighting integral to the structure. The sleeping component was the simple part about the design—within such a small room, what would they do with the desk and chair when the bed was down? Client and designer collaborated once again and devised the concept of a collapsible desk. When folded up, it lays virtually flush on the bottom surface of the bed frame; when down, the “L” shaped desk is supported on one end by a pair of legs. Guest room and office in one…voilà! Sasha elaborated more on the process and evolution of the project, explaining, “Every design decision in Unit 6 was truly collaborative. I brought suggestions about the visceral experiences- glass here, barn board there, grainy wood, clean lines, more warmth. These suggestions showed in the form of photos, sample materials, and the occasional rant about how I wanted a piece or space to make you feel. Jack brought function to the process. He thought about how doors needed to open for ease of movement in relation to other objects in the room. His engineering background was a huge help here, ensuring our decisions reflected a deep consideration for beauty and form without sacrificing function. 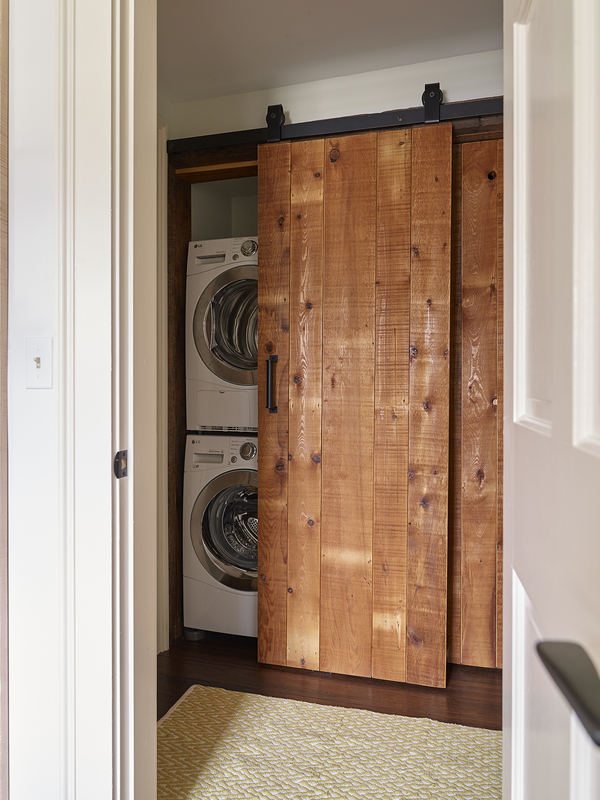 This project gave us an opportunity to learn from each other and build something together.” The industrial looking barn track doors that conceal the washer and dryer are the perfect representation of this thoughtfulness. The machines are stored in a small space off of the main hallway and are creatively hidden and unencumbering.